BEIJING (AP)—It really was that close between Michael Phelps and Milorad Cavic. Official timekeeper Omega released a digital photo sequence of last week’s riveting 100-meter butterfly finish at the Olympics—and it’s still not clear to the naked eye just who won. 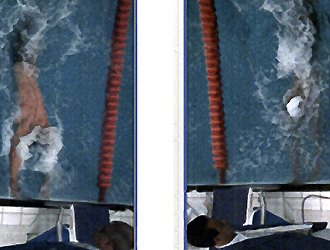 Phelps (left) and Cavic (right). However, according to Omega timer Silvio Chianese, the results are clear. “In the third set of images, with Phelps on the left, it is clear he is really pushing hard, while Cavic, on the right, is just arriving,” Chianese told The Associated Press on Saturday. Last week’s victory gave Phelps his seventh gold medal of the games, tying him with Mark Spitz for most golds in a single Olympics. A day later, Phelps won his eighth gold as a member of the United States’ 400 medley relay squad. Phelps’ time of 50.58 seconds was confirmed after a review down to the 10-thousandth of a second; Cavic’s time was 50.59. Chianese explained that it requires 3 kilograms (6.6 pounds) of pressure to activate the touchpad. 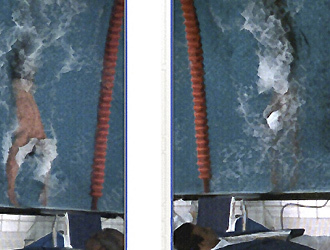 The photos were taken by Omega cameras placed directly above the finish line, slightly angled to include two lanes in each photo. Chianese said the touchpad is the primary source to determine the race winner, while the photos can only be used as backup material. “We mainly use the photos for relays, to determine disqualifications if someone dives in before a teammate touches,” he said. “This is the only sport where athletes don’t cross the finish line. The athlete stops. Serbia coach Kapor Mladen filed an appeal but accepted the results after reviewing the photos immediately after the race. 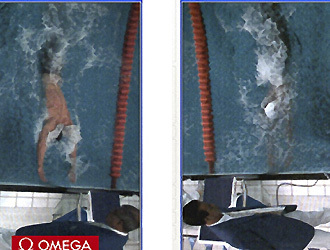 FINA executive director Cornel Marculescu had been pressing Omega, one of Phelps’ sponsors, to release the images for several days. “This is very simple. Our sport is about which athlete stops the time by pushing the touchpad,” he said. “Omega can’t stop the time.